Proper ventilation is essential in minimizing the effect of heat. Birds don’t sweat and depend on losing heat through respiration and releasing heat from surfaces such as wattles, shanks, and un feathered areas under the wings. Increasing air movement will help birds lose excess body heat. The distribution of air to pick up heat and moisture before it leaves the house will improve bird comfort. Nothing should be inside the house that would restrict the flow of air. Fans to move the air inside the house may also be necessary. In houses with curtains on the sides and exhaust fans to improve ventilation, curtain height and fan controls must be carefully coordinated in order to maximize air flow and at the same time achieve maximum benefit from the moving air. 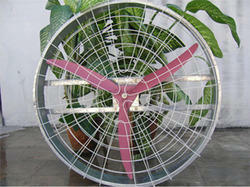 Fans to create air movement inside the house may also be needed. Circulation fans can be 1750 rpm un rated units, but should have sealed motors. In houses that are environmentally controlled and depend entirely on fans in the sidewalls to exchange air, the uniformity of air distribution depends on the location, design, and adjustment of the air inlets. The longest path of air from inlet to outlet should not exceed approximately 75 feet. Air inlet control is critical to good distribution. The size of the inlet should change each time there is a major change in ventilation rate. Depending on outside temperatures, manual baffle adjustments may be required several times per day. Accuracy of ventilation rates may be improved through the use of manometer controlled winches on the curtains or baffles. The fans in all three types of houses should be spaced about every 25-30 feet and should be directed horizontally. The objective of the fans is to provide air movement around the birds; therefore, location and spacing should be determined by the results of the air movement. In order to save energy, all space fans should be controlled by a thermostat set at approximately 80 degrees F. By using a relatively high setting, the fans run only when temperatures begin to rise and additional air movement is needed. All fans should have guards and safety shields to prevent birds from getting in the fans and to protect employees. Proper maintenance of fans is essential to insure maximum benefit. Blades and louvers should be cleaned regularly and proper belt tension maintained to maximize the efficiency. Cleaning of poultry netting on the sides of the house may also be needed to improve air flow. Incepted in the year 1990, we “Jay Enterprises” are leading manufacturer and supplier of a commendable array of Wire Fencings, Poultry Equipments, Barbed Wires, Poultry Ventilation Systems, Poultry Control Systems, Poultry Cages, Feed Storage System, etc. We are a Sole Proprietorship Company which supplies the best quality poultry equipment, G I Chain link, Day one old “Cobb 400” broiler chicks in Gujarat. We pride ourselves as one among the most well established poultry manufacturing firms excelling in offering various poultry equipment and products that are highly accomplished for their supreme quality and longevity. We make use of various pioneering technologies and innovations to ensure that the products delivered by us are manufactured with utmost perfection and durability. We primarily involve in the manufacture of various equipment and products. On the other hand, our offered chicks are grown in best hygienic conditions to ensure good health and disease free breed. Also, we provide all the products under the brand name Chakra. Our experience in chain link and related materials has achieved us a award as the best business providers.